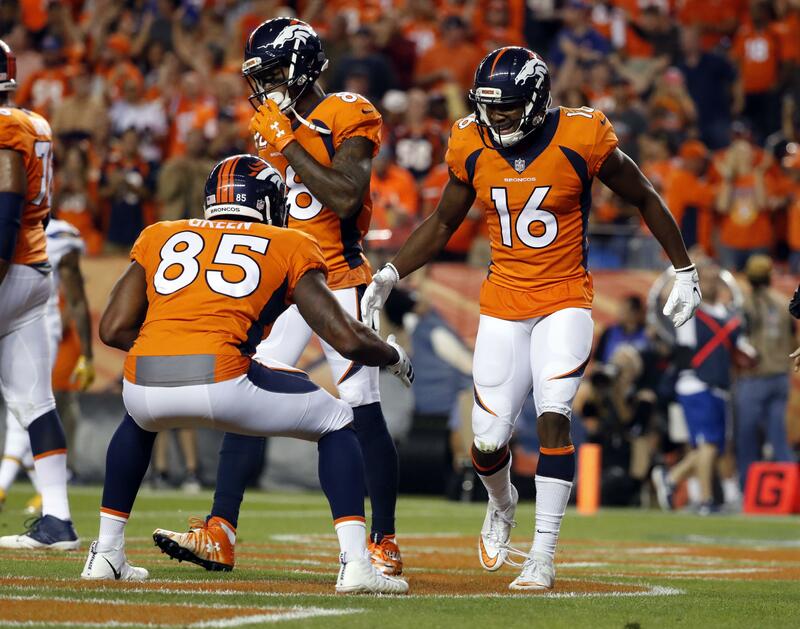 Mon., Sept. 11, 2017, 10:51 p.m.
DENVER – Shelby Harris got a hand on Younghoe Koo’s 44-yard field goal attempt with a second left, and the Broncos began the Vance Joseph era with a 24-21 win over the Los Angeles Chargers on Monday night. Moments earlier, Koo had nailed the kick, but Joseph called a timeout to ice the kicker. On the re-do, Harris – who made the team because of a rash of injuries along the D-line – sliced through and got his right hand on the kick. It was reminiscent of last year’s opener, when the Broncos escaped with a 21-20 win over the Carolina Panthers when Graham Gano missed a 50-yard field goal with 4 seconds left. Denver took a 24-7 lead into the fourth quarter but had two turnovers that were converted into touchdowns, a missed field goal and a punt. The Broncos held Philip Rivers to 115 yards passing through three quarters but let him engineer a comeback when Siemian threw an interception and Jamaal Charles fumbled on plays that were upheld despite video evidence that had the crowd of 76,324 convinced they should have been overturned. Safety Adrian Phillips intercepted a pass that went off cornerback Desmond King’s leg as King was tackling Fowler while the ball was still in the air. A review upheld the turnover and L.A. pulled to 24-14 on Keenan Allen’s 5-yard TD catch with eight minutes left. Less than a minute later, Jamaal Charles fumbled – although replays showed his left elbow was down before the ball was ripped away by Korey Toomer. Cornerback Casey Hayward recovered. One play later, Rivers hit Travis Benjamin for a 38-yard touchdown that made it 24-21 and safety Darian Stewart hobbled off with a strained groin. Back-to-back sacks of Siemian set up a 50-yard field goal try that McManus pushed wide right. The Broncos led 14-7 at halftime after Siemian threw a 5-yard scoring pass to Fowler and scored on a 1-yard keeper . Rivers stayed away from the All-Pro tandem of Aqib Talib and Chris Harris Jr., instead targeting Roby and safeties Darian Stewart and Simmons, both of whom held up well. Roby atoned for his crucial penalty with an interception in the third quarter on a pass intended for Keenan Allen. That led to Siemian’s 6-yard TD toss to Fowler that made it 21-7. Brandon McManus kicked a 20-yard field goal on the last play of the third quarter, capping a 78-yard drive that ate up 8 minutes, 16 seconds. The game presented landmarks on the football field , along the sidelines and in the broadcast booth . With Anthony Lynn also making his head coaching debut, this marked the first time two black head coaches worked their first NFL game against each other in the same game. Lynn burned one of his timeouts with a curious throw of his red flag to challenge a rather inconsequential incompletion in the first quarter. The undrafted pro from the University of Pittsburgh is generously listed as packing 335 pounds on his 6-foot-3 frame. His teammates gave him his nickname because he reminds them of former Broncos run-stuffer Terrance “Pot Roast” Knighton. INJURY UPDATES: Chargers backup SS Rayshawn Jenkins left in the second half with a concussion. So did Broncos starting right guard Ronald Leary, who was replaced by second-year pro Connor McGovern. Leary will be in concussion protocol during the week as the Broncos prepare to face his former team, the Dallas Cowboys. Broncos rookie CB Brandon Langley left in the fourth quarter with a knee injury. Published: Sept. 11, 2017, 10:51 p.m.